Hello. Welcome to the website. 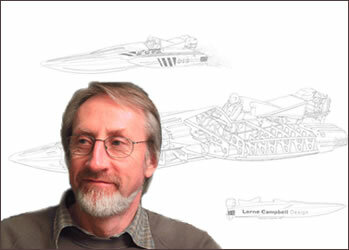 I’m Lorne Campbell of Lorne Campbell Design and I specialise in the design and consultancy of high speed powercraft. I am very pleased to have you as a visitor. I thought it would be helpful for you and good for me if I told you something about what Lorne Campbell Design does and my history since starting fast powerboat design back in 1970. You will also find information about the design/consultancy services I can offer, together with info on some past designs. The gallery on the Boat Designs page shows leisure, military, commercial and race craft – both monohull and multihull – and I have included a section with articles and papers which give an idea of my philosophy and a few of the things I have learned over the past 36 years. Have a look through the site and be sure to include the section on the Bladerunner from ICE Marine and the thinking behind it. It is the latest incarnation of a concept that started life in 1974 and I firmly believe it is a useful contribution to the world of high speed powercraft. I hope you will find it and the rest of the site interesting.